Against the cold, gray, bleak background of Brooklyn in January, colorful things, and literally anything with the smallest hint of cheer, are sure to stand out. 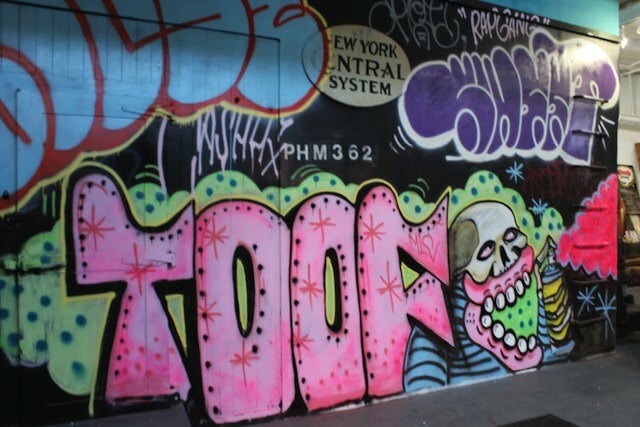 That’s why you may have taken a step back when confronted with the bright, cartoony, bubblegum-pink gums with pearly white teeth lining the top of buildings or plastered on walls all around Brooklyn in the past few weeks. So who is this person painting grins on all of your buildings? 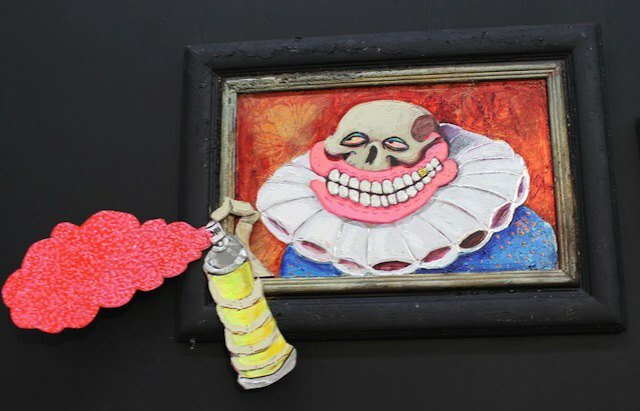 You have London-based street artist Sweet Toof to thank for these paintings, and for putting that smile on your face as you drudge to the finicky L train in nine degree weather. The artist was in town for three months creating work for his show “Derailed” at Pandemic Gallery. The show is closed now, but there is a lot to know about the artist as you see his pieces pop up in Brooklyn, and soon all over the world. If you ask Sweet Toof where the gum and tooth motif came from, you’ll likely get a different answer each time. When I interviewed him back in 2011, he cited a series of untimely deaths of friends that started the fascination with skeletons, and also his hobby collecting bones in art school as subject matter for his paintings. He mentioned a fascination with teeth, how they are the only visible part of a skeleton, and how they’re kind of a constant reminder of death. This time around he mentioned a love for “bringing something that’s dead back to life, and giving them a story.” Looking at this symbol over and over, in paintings, carved in wood, plastered on buildings, and even made of clay, it’s clear that no matter what the initial fascination stems from, the artist continues to entertain his curiosity of the morbid juxtaposed against the bright and happy cartoon feel of the teeth. “I just like seeing stuff with energy and sort of, spontaneous stuff and stuff you can see people had fun doing or makes you laugh, sometimes people can be a bit serious,” the artist said, summing up the joy of his work. “I heard they weren’t arresting people which sounds...not bad, but I was near Bed Stuy when that incident happened. There were so many cops around everywhere, it didn’t feel like a good time to do anything, out of respect. All these people just died. But another thing I wanted to do was something on the Brooklyn Bridge, but as soon as we tried to stop on the side of the road it was like ‘blip blip!’ The cops came right away, the cops were really fast on that.” He went on to say this is probably due to the recent to-do two German artists caused as they put a white flag on top of the Brooklyn Bridge. And speaking of the politics of street art, he mentioned that Brooklyn isn’t exactly alone on that front. But what you might not see on the street, is the artist’s classically trained hand. 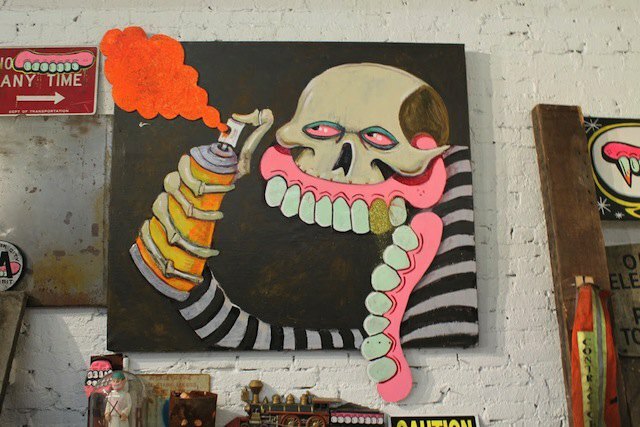 Before he came to spray those pearly whites on the walls of your favorite pizza place, Sweet Toof went to art school, and developed a refined style that’s influenced by his street art, and casts an influences on it as well. When it comes to creating work indoors, he often creates large and small scale oil paintings in a baroque style for his gallery shows that borrow elements of the contemporary urban world. 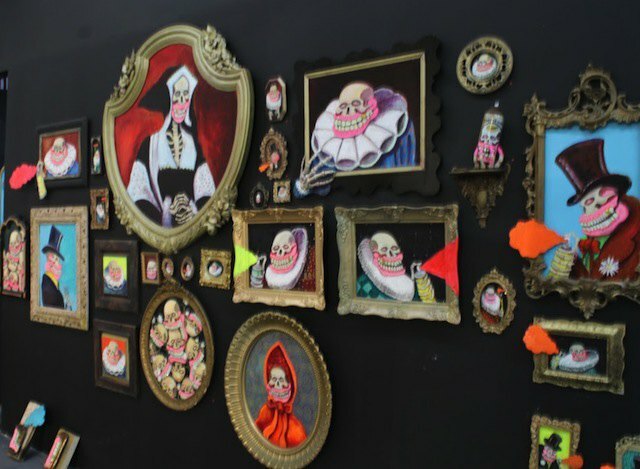 The macabre paintings usually feature his signature skeletons doing different things. Sometimes they’re playing polo or riding horses, other times posing for a traditional portrait, or acting out a scene from Hamlet, and usually donning 16th century gowns, collars and other garb. In the background you can see water towers, bridges, trains, and other elements from a street artist’s paradise. Without fail, the figures in his paintings, both indoors and out, flash those signature bright pinks gums and stark white teeth. Sweet Toof has something for everyone. By bringing his street art motif into his paintings, his more refined work sees a contemporary edge, a juxtaposition that’s dark, surprising and delightful at the same time. By bringing his trained hand and bubbly disposition to the streets, the outside world gets a dose of thought-provoking morbid joy, as if to reflect on the dead of winter, and the delight in a colorful, positive outlook.